The extension has the ability to detect most settings automatically when launched. It detects your system architecture, OS version, plugins to be removed and selects the best plugin to be installed on your system. 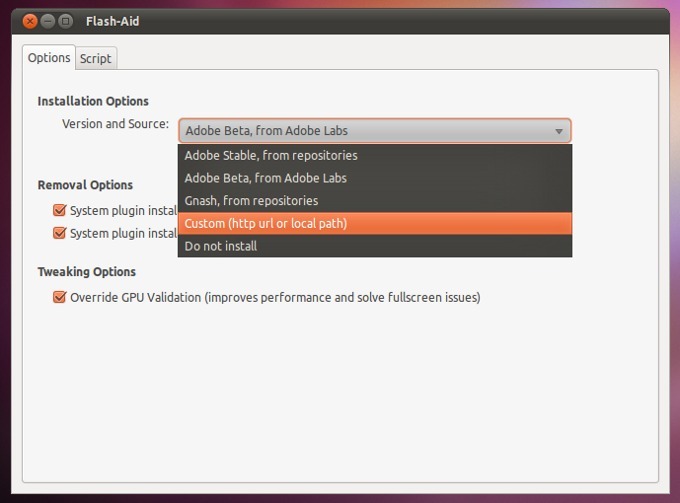 It also offer flash update alerts, that detects new beta versions from Adobe Labs. The advanced mode interface also allows to install flash from Google Chrome browser or from a local file. Flash-Aid is an extension designed to remove conflicting flash plugins from Ubuntu Linux systems and install the appropriate version according to system architecture. Having used flash-aid previously I installed it on 11.04_x64 without having any way to set preferences. No wizard. Firefox 5.0. Any suggestions will be appreciated. Thank you. Please disregard my earlier comment-I simply needed to place my ‘flash-aid’ toolbar button! Currently the Flash-Aid has been removed by the author. There’s alternative ways to fix this? I just installed Ubuntu 12.04 and I can play YouTube vidiews and other swf files but Facebook and Adobe say I don’t have flash player installed. Any thoughts? Is there an alternative to Flash-Aid now that it is gone?